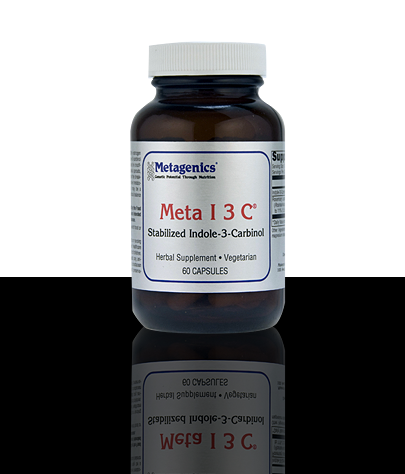 Meta I-3-C® is designed to promote healthy estrogen metabolism and balance by featuring indole-3-carbinol (I3C), a naturally occurring compound found in cruciferous vegetables such as broccoli, Brussels sprouts, and cabbage. Through its ability to promote the breakdown of estrogen to its beneficial, protective metabolite—2-hydroxy estrone—indole-3-carbinol may be a safe and effective way to help achieve beneficial balance in estrogen metabolism. Helps promote the health of estrogen-sensitive tissues—such as those of the breast and cervix. Promotes the formation of “good,” protective 2-OH via its influence on hydroxylation pathways. Supports the detoxification of estrogens, and may also support healthy metabolism of other steroid hormones and xenoestrogens. Provides rosemary extract to reduce oxidation and help ensure potency.